<\/u><\/b>This is a red flower with a green leaf to its' right hand side on a blue background. The centre of the flower has a black plastic button attached to it which has 3 small diamant\u00e9 style \"stones\" made of cut glass which really catch the light. It also has small amounts of glitter on the flower and leaf to add to its' shimmer effect. 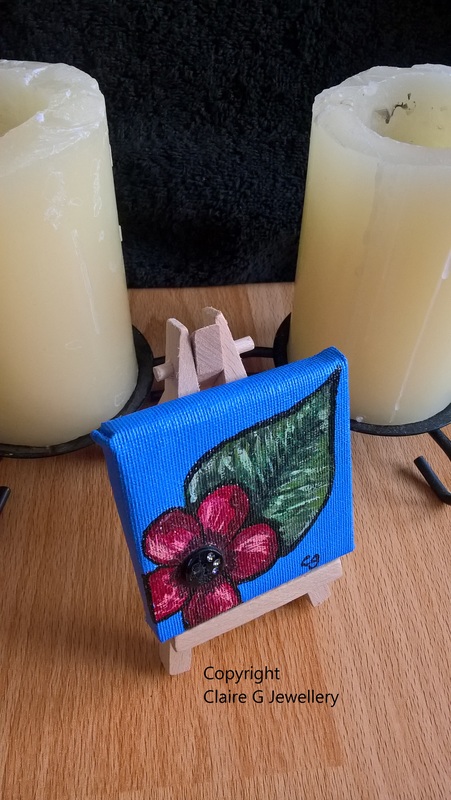 It is a hand painted acrylic painting on a mini canvas with wooden display stand (as shown in the picture.) 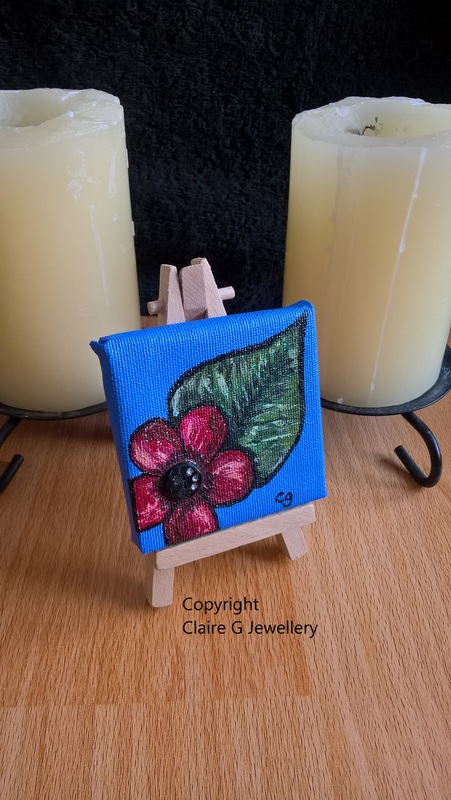 This is a one off original and perfect if you would like to buy some artwork but don't have much space to display it, or just want a little something for a birthday gift or special occasion for a loved one. Main colour\/s of painting<\/u>: Blue, green, red, pink, white and purple-red with small amounts of glitter. 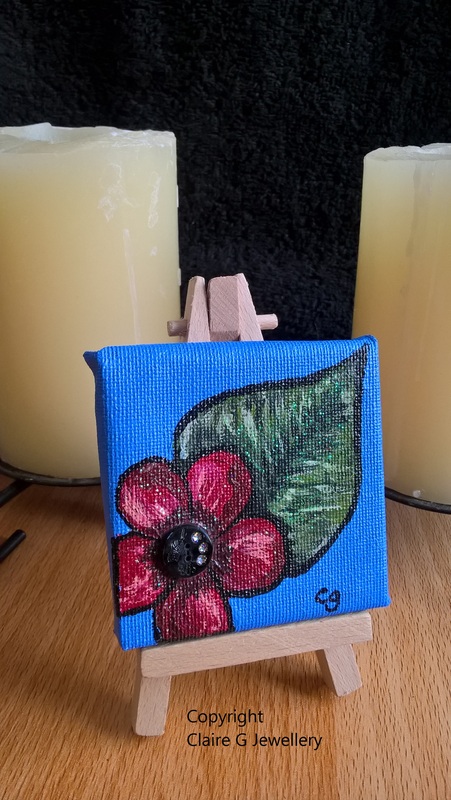 This is a red flower with a green leaf to its' right hand side on a blue background. The centre of the flower has a black plastic button attached to it which has 3 small diamanté style "stones" made of cut glass which really catch the light. It also has small amounts of glitter on the flower and leaf to add to its' shimmer effect. 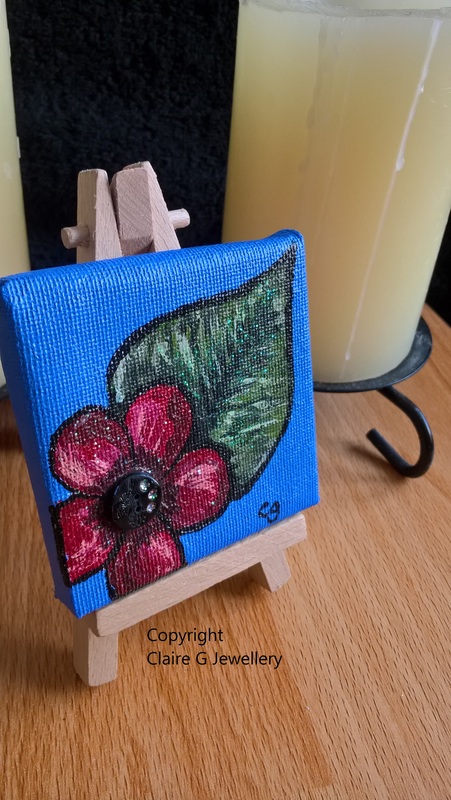 It is a hand painted acrylic painting on a mini canvas with wooden display stand (as shown in the picture.) This is a one off original and perfect if you would like to buy some artwork but don't have much space to display it, or just want a little something for a birthday gift or special occasion for a loved one. Main colour/s of painting: Blue, green, red, pink, white and purple-red with small amounts of glitter.